Understanding the Spirit of Reparation. Psalm 69: 15-16, 30-31, 33-34. The Memorial of Saint Peter Julian Eymard, Priest. The Seventeenth Saturday of Ordinary Time. The Memorial of Saint Eusebius of Vercelli, Bishop. “It was the Lord who sent me to prophesy against this house and city all that you have heard. Now, therefore, reform your ways and your deeds; listen to the voice of the Lord your God, so that the Lord will repent of the evil with which he threatens you” (Jer. 26: 12-13). The Holy Prophet Jeremiah in today's first lesson, when he was threatened with a death sentence for telling the truth. And it is purely coincidental that we read his words of defiance on a First Saturday, on which we make reparation. Thankfully, for the Prophet, his words stabbed at the heart of the priests, prophets and princes who heard him: they spared his life. John the Baptist, in our Gospel lesson, didn't fair so well: his words stabbed to the heart as well, but Herod reacted in fear and anger, not in repentance, and had John's head cut off. Jeremiah and John: two peas in a pod, both sent by God to call His people back to the truth, both doing it in exactly the same way, and both getting very different results. Of course, we know why God, in His Providence, allowed John to die, as it was part of the whole plan of salvation that God devised for us in Christ; Jeremiah's prophesy was only a prelude. But it does teach us some valuable lessons about the whole principle of reparation, which is what the First Five Saturdays are all about. At the risk of telling you what you already know, the requirements for the First Five Saturdays are simplicity itself: Confession, Holy Communion, five decades of the Holy Rosary and fifteen minutes of meditation on the Mysteries thereof. What may not be so simple is the requirement that these very simple things be done in a spirit of reparation. On the surface, we could interpret that command of the Mother of God in a very matter-of-fact manner, and just say that we simply make an intention to offer up these four tasks for the offenses listed by our Lady: (1) attacks upon Mary's Immaculate Conception; (2) attacks against her Perpetual Virginity; (3) attacks upon her Divine Maternity and the refusal to accept her as the Mother of all mankind; (4) for those who try to publicly implant in children's hearts indifference, contempt and even hatred for their Immaculate Mother; and (5) for those who insult her directly in her sacred images. And it might be advantageous for us, on some future occasion, to look at those things in detail. But, given the example to us in Holy Mass today by the two great prophets, Jeremiah and John, we need to tackle this Spirit of Reparation first, because it can be misinterpreted; and, it is most frequently misinterpreted by those who allow themselves to do it in a spirit of contentious anger. Let me try to explain what I mean. One of the virtues—if you want to call it that—presented to us by our Lord in the Holy Gospels and by our Lady at Fatima is a hatred for sin and evil; but, we are hampered by the fact that English is not nearly as expressive a language as Greek and Hebrew; and, for us, hatred is a loaded word. The word for hate in Greek is μισήσει, which literally means to reject on an intellectual level; in other words, when I express μισήσει for your argument, I'm simply saying that I have heard what you have to say, and have concluded that it's wrong, and therefore reject it. There is no connotation of an emotional response in the word; but, when we translate the Gospels from Greek into English, we need to find an English word that means the same thing—or something close to it—so, we choose the word “hate,” which is an emotionally charged word. Even if we were to try and tone it down by choosing the word “rejection,” that, too, implies an emotional response for us. And I have often feared that many devotees of Fatima, when entering into their First Saturday duties, practice what they believe is a spirit of reparation with a kind of curmudgeonly attitude, as if they're saying, “Lord, single out those who have committed these five offenses against your Mother, and make sure they get their comeuppance.” That does not even resemble a true spirit of reparation. Now, the interior life is like every other aspect of life in one respect, in that we bring to it all the emotional baggage that results from how we've been raised and what we've had to endure in our lives; and, I've known—and I'm sure you've known as well—people who are just naturally bitter and angry people. Their patron saint is the Prophet Jonah. If you've never read the Book of the Prophet Jonah, it's very short, and right at the very beginning Jonah is presented to us as a very bitter and angry man without any explanation why. He just is that way, and everything that happens to him is because of his penchant to always assume the worst about everyone; and, when he finally agrees to go and preach to the city of Nineveh, he secretly harbors a desire that they don't repent, because he wants to see them destroyed. They do repent, and the last scene in the book is Jonah sitting under a tree hating God because God didn't destroy them. God reaches out to Jonah and wants to talk to him about it, but Jonah refuses to listen, and that's how the book ends. And we never do find out why Jonah is that way. We've all known people like this: they're angry at the world, and take out their anger on everyone they meet, and we will probably never know why. And when such people take up the First Saturday devotion, their idea of a spirit of reparation is to beg our Lord to punish those who have offended our Lady. But that's not reparation. It's the Prophet Jeremiah, in our first lesson today, who gives us the true spirit of reparation: “…reform your ways and your deeds; listen to the voice of the Lord your God, so that the Lord will repent of the evil with which he threatens you” (26: 13). Reparation has to be in conjunction with the virtue of charity. We make reparation not because we hate the sinner, but because we love the sinner and we want the sinner to be spared. Ideally, we want the sinner to repent; but, even if he doesn't repent, we still want him to be spared. Why? Because there isn't one of us who is not a sinner, and the mercy we wish for others is the measure of the mercy we shall receive ourselves. 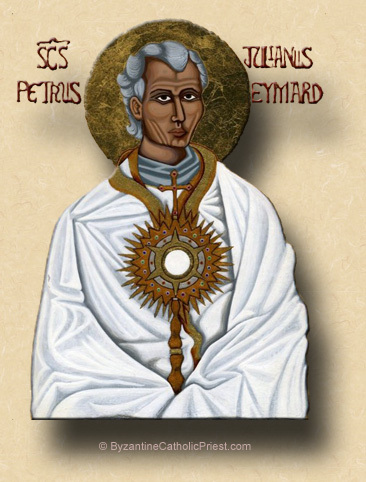 You will have noticed today that I chose to do the orations, not for the Mother of God on First Saturday, but for Saint Peter Julian Eymard whose optional memorial is today. If you've visited the Holy House recently you will have seen the redesigned reliquary in the chapel, which contains a relic of Father Eymard. He was the founder of the priest-adorers of the Holy Eucharist and the Priests of the Blessed Sacrament, and I thought it was appropriate that we celebrate his Mass on this day on which we typically have a Holy Hour. During the Holy Hour, let us pray for reparation, but making sure that it's true reparation we seek, asking our Lord to visit his mercy on all sinners, so that they may be saved.